Moorhead City Hall is located at 500 Center Avenue, Moorhead, MN 56561; phone: 218-299-5305. Photo: Lew A. Huntoon House, ca. 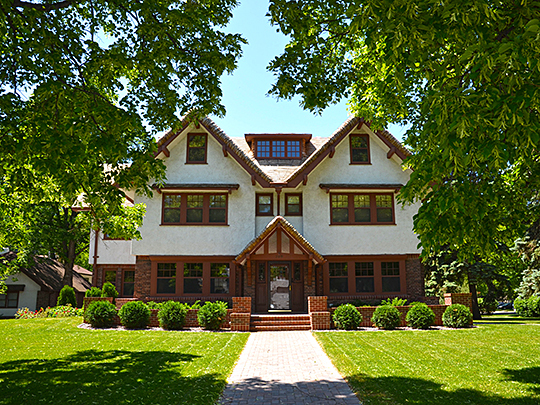 1910, 709 8th Street South. Moorhead, MN Listed on the National Register of Historic Places in 1980. Photographed by User:Betsysahr (own work), 2012, [cc-by-3.0 (creativecommons.org/licenses/by/3.0)], via Wikimedia Commons, accessed April, 2014. Moorhead was a river-crossing frontier settlement beginning about 1870. A town was founded in 1871 and named for William G. Moorhead who was a director for the Northern Pacific Railway. Moorhead was incorporated in 1881. Moorhead is home to Concordia College, a private, liberal arts institution. Moorhead lies along the Red River, opposite Fargo, North Dakota.